As a photographer I always eat with my eyes first. I’m captivated by texture, color, shape, movement, composition, and light. 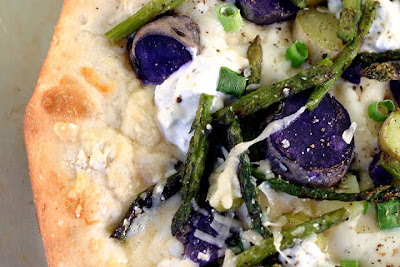 So, when I found a picture in the May 2009 volume of Bon Appétit of a white pizza with asparagus and fingerling potatoes, I wanted to make it right away. Alas, things didn’t turn out as well as pictured. I was a bit disappointed in the recipe as it lacked what many white pizzas do, acidity. I still like their concept, but have created a more balanced pizza from this gorgeous idea. 2. Scrub the potatoes and place them in a sauce pan. Add water until covered by about an inch. Heavily salt the water and cook on medium high until easily pierced with a fork. Remove from the water and set aside. 3. Place the asparagus on a plate and drizzle with olive oil and sprinkle on salt, pepper, garlic powder, and onion powder. Cook on the grill until light char marks form. Remove and set aside. 4. Brush a 12 inch pizza pan lightly with olive oil and sprinkle with cornmeal. Stretch and roll the dough and place on the pan. Brush with 1 1/2 Tablespoons olive oil, and sprinkle with minced garlic, garlic powder, onion powder, and red pepper flakes. 5. Cut the asparagus into three parts and slice the potatoes. 6. Layer on half the scallions, the mozzarella, potatoes, lemon goat cheese, asparagus, the rest of the scallions, Parmesan Reggiano, and a good pinch of salt & fresh cracked pepper. 7. Set the pizza on the grill and close the lid. Turn grill to medium high and cook for 5 to 8 minutes or until cooked through. Turn to medium for a thicker crust pizza and cook longer. Remove onto a cookie sheet with tongs. 8. Drizzle with lemon juice and cut into wedges. Note: See http://www.thecookingphotographer.com/2009/04/lets-talk-dough-pizza-dough.html for information on pizza dough and grilling techniques. Oh wow, how pretty with those potatoes! It looks wonderful! What a fabulous pizza!!! I love goat cheese on pizzas like this! Fantastic photo! You make the most wonderful sounding pizzas! Wow, that is so lovely! The potatoes are so striking! I just made a focaccia with thinly sliced potatoes and it would have been much prettier with purple ones. I happened upon your photo on gawker, and I returned just this hour with purple potatoes from whole foods and was pondering what to do, I have 5# of pizza dough proofing, so I guess that's settled. Gorgeous photos! Laura that pizza looks over the top unbelievable. If you wouldn't mind sending a slice my way (kidding!) I am not really kidding but I guess I will have to be. Of course your photo could win a major award!! I hope it turns out well Susie. Lol Ginger! I wonder how shipped pizza would arrive. Nooo maybe I don't want to know. Wow really gorgeous photo of this colorful food. I love unusual pizzas (well, we did eat white pizza in Italy all the time, so not so unusual) and this looks beautiful for a springtime meal! Love goat cheese with the asparagus! Yay Sara I'm so glad you liked it! Thank-you for letting me know, the feedback really helps. This is a gorgeous pizza. I'm sure it tastes as good as it looks. What a great looking pizza. I had my first purple potatoes a few weeks ago and loved them. I'm finally going through the potato ho down round up. Your pizza looks fantastic! The colors are lovely, and the lemon goat cheese sounds perfect. Laura, you've just taken all my favorite flavors and put them together in one dish! It looks amazingly delicious, and the colors are gorgeous! Outstanding recipe and the colors! Oh, the colors are divine. This is going to be served next week here at my house. Thanks for sharing!